In every culture throughout history, people have used stories and music to teach important lessons. Elaine Penn does just that by incorporating timeless tools, along with meaningful discussions and interactive exercises to connect with students emotionally and intellectually. With Elaine’s experiential approach, students learn on a deeper level and are able to apply the lessons they’ve learned in their everyday lives. By sharing an inspiring with a blend of stories, music, and learning, Elaine takes students on a journey that positively changes their perspectives and how they think, feel, and act. With a background as a Higher Education Administrator and as a collegiate athlete and coach, Elaine’s programs on leadership, diversity, stress management and positivity are great for all types of college audiences. Elaine Penn, M.Ed. is a motivational speaker, executive coach, workplace consultant and singer-songwriter who inspires people to reach their highest potential. She works with universities, businesses, government agencies, and individuals around the world. Prior to coaching, Elaine worked in higher education as a Division I Volleyball Coach, Director of Campus Recreation, and Executive Producer of five award-winning educational documentaries. In her keynotes, Elaine uses stories, discussion, music and audience interaction to help students dream of what is possible and unleash their best selves. Elaine received her bachelor’s degree from Greensboro College and her master’s degree from the University of North Carolina at Wilmington. While at Greensboro, she received numerous athletic honors, including All-American in Basketball and All-Conference in Volleyball. In recognition of her achievements in basketball, her jersey was retired. She was inducted into the Greensboro College Sports Hall of Fame in 1996. Growing up in a musical family, Elaine has been singing professionally for most of her life. Her CD of original music is called: Love Is The Way. Elaine has created and led interactive retreats for students and staff for more than 20 years. The field of “Positive Psychology” shows that when the brain is in a positive state, stress is reduced, while energy, performance, creativity, intelligence, and happiness are greatly increased. So how do we help students maintain a positive mindset when academic pressures are real, extracurricular obligations pile up, and stress is a top health issue on college campuses? Elaine Penn is a former college athlete and volleyball coach and has spent her adult life dedicated to wellness. In this experiential program, Elaine uses stories, science, and music to teach students how to slow down your brain and open your heart to be more positive and to experience greater health, happiness, and success. She explores the science behind positive self-talk and why perception becomes your reality. Finally, students will see how habits like gratitude, focusing on what’s good in life, random acts of kindness, meditation, and exercise help them find their zone. 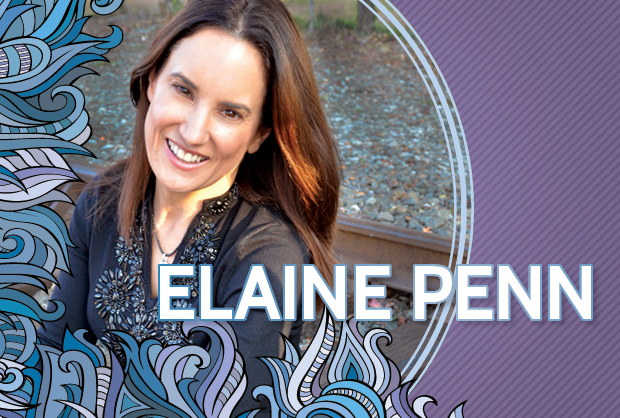 Elaine can be joined by nationally acclaimed sound healer and singer-songwriter, Nancy Pitkin. The use of sound has been used for thousands of years as a healing technique. Combining original piano compositions with instruments like the Tibetan singing bowl, Native American flute, drum, Pan flute, bells, and chimes, Nancy takes you through a sound meditation towards the end of the program that balances and relaxes your body, mind, and spirit. She plays light piano music in the background during the program and performs several original songs with Elaine. Science reveals that the brain is primed to respond to music. Music taps into our emotions. It is relaxing, inspiring and enhances learning. how practicing positivity and using sound techniques can lead to a more positive life. How many times have we walked past someone on the street, only to form an assumption about them? Our assumptions could come from the way they are dressed, how they speak, whose hand they are holding if they are experiencing homelessness, or what religious book they are reading. The truth is, when we buy into an assumption (or single story) about anyone, we foster stereotypes and fear. Join Elaine as she interweaves stories from her life and the lives of others to examine how stereotypes diminish a person’s dignity, create divisions, and leads to prejudice and intolerance. Elaine also invites students to share their experiences with diversity in areas like race, ethnicity, nationality, religion, LGBTQ+ and gender. Incorporating powerful life lessons and original music, Elaine encourages students to identify and eliminate personal stereotypes, challenge others regarding stereotypical comments, stand up to any prejudice, tell positive stories that transcend stereotypes, and share the many stories of their lives that have shaped who they are. When we connect with each other and share our stories, we discover we have more in common than we ever knew. This program is a perfect keynote for any group placing value on building meaningful relationships in their campus community. how to connect with others by sharing personal stories and finding common ground. Student leaders can help shape the lives of others on campus. Imagine how profound this impact could be if they consciously use their influence through leadership principles like knowing yourself and using your strengths to the fullest, developing an inspiring vision and communicating it to others, creating meaningful connections and empowering people, understanding the power of your words, and making a positive difference every day. If you are looking for a message that focuses on heart-based, people-centered leadership, Elaine Penn’s keynote is a perfect addition to your next event. In a world where text messages have replaced face-to-face conversations, and leadership has been boiled down to successful habits, Elaine will hearten your student leaders with a message that speaks to the core values of leadership. By incorporating discussion, stories, and music, Elaine motivates your students to inspire others. how to use purposeful communication to have a more engaging presence. Campus professionals are extremely busy! They wear many hats and juggle many balls. It often helps for an outside facilitator to organize student leadership retreats. Elaine is a great choice to help you host a powerful and impactful retreat to create real change in your organization! Before a retreat, Elaine facilitates an intake with you, which involves asking questions and discovering the outcomes you want and need. In other words, what would you want the participants to experience, learn, feel, do, and take away from the retreat? Using that information, she creates a customized retreat for your group. Typically, the focus is on one of the following topics: Leadership, Communication, Team-building, Diversity, Visioning, and Action. Elaine’s retreats are perfect for rejuvenating and reconnecting your students and staff. The retreats are from a half day to three days in length. actionable strategies they can use immediately to start creating and leading more fearlessly. Elaine has extensive experience in consulting as well as developing workshops and retreats for professional staff on strategic visioning, communication, internal relationships, leadership/engagement, positivity in the workplace and work/life balance. She leads group coaching sessions to help clarify goals, overcome obstacles, and take clear action.